(SPOILERS) I’m a sucker for a good lighthouse drama. Or comedy (The Goodies’ Lighthouse Keeping Loonies being up there with the best). 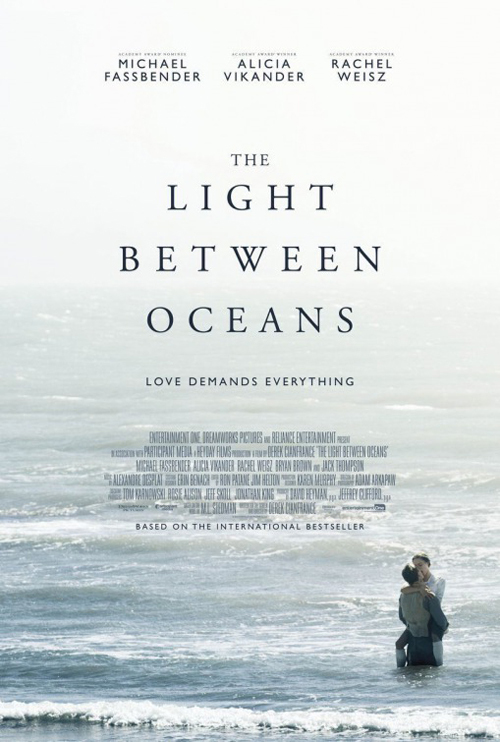 Unfortunately, Derek Cianfrance’s adaptation of ML Steadman’s novel The Light Between the Oceans isn’t that. It isn’t bad per se, and can boast a couple of very dedicated performances from Michael Fassbender and Alicia Vikander (and Rachel Weisz in an effective supporting role), but its melodramatic progression feels patently forced, such that you can see the plot staples popping out as its leads strain to invest their characters with plausibility. Fassbender’s Tom Sherbourne, a reclusive and damaged World War I veteran (if only Diane Prince had been there to help him at just the right moment), seizes the chance to become lighthouse keeper at Janus Rock, off the coast of Western Australia, but it isn’t long before he falls for, and marries, Vikander’s Isabel Graysmark. Following two miscarriages, the arrival of a boat occupied by a dead man and a baby girl is greeted as a gift by Isabel, and she persuades the reluctant Tom not to report the incident and pretend the girl is theirs. The proceeding tale abounds with unlikely coincidence, in which, on a rare occasion they visit the mainland (for the baby’s christening), Tom just happens to see the actual mother (Weiz’s Hannah Roennfeldt) at the grave of her husband and daughter. Tom’s growing guilt, leading to his sending Hannah notes and mementos, is convincingly portrayed by the Fass. And Vikander is hugely affecting as a mother overcome by the loss of her children. Still, though, it’s painfully evident, for plot expediency, that Tom is granted the picture’s moral centre while Isabel remains oblivious even when Hannah appears on the scene, so gradually reducing sympathy with her point of view and maternal attachment. This is a picture that, in order to stay its course, requires its characters to engage in Tom’s reticence from communication and expressed feeling, at least until Weisz’s sympathetic mother, struggling to find a path with a reunited daughter who just wants her “real” mommy back, is given the empathy and insight the main couple lack. There’s a sense, as with his previous The Place Beyond the Pines, that Cianfrance lacks a firm grip on the storytelling side, that he’s plumped for a dramatic weepy but has only sporadic investment in or identification with the tale itself; you can see a similar interest in intertwining generational tragedies running through both films, with ellipses and the past returning to haunt protagonists. The Light Between the Oceans is gorgeously shot by Adam Arkapaw, and Cianfrance is a sensitive actor’s director, keen to linger and draw out as much resonance as he can from a performance, but he’s dreadfully let down by Alexandre Desplat’s over-emphatic score, almost a parody of the tearjerker, it’s so unsubtle. I don’t think I’ve ever come across a composer as variable as Desplat, who can completely make one movie and all but ruin another. While it takes unconvincing dramatic licence at key points, The Light Between Oceans is at least more grounded than The Place Beyond the Pines, and more convincing overall. The introduction of Hannah, although burdened by an awkward and unnecessary flashback (Weisz is easily a great enough actress to carry inn her face and bearing all you need to know) that threatens to schism the picture halfway through, turns out to be the element that sustains it. It’s her character who can offer the forgiveness and understanding Tom and Isabel lack. And there is the hope of generations carrying this insight onwards, in the now adult Lucy-Grace (Slow West’s Caren Pistorius). Nevertheless, one almost feels there was a better, lower-key and more meditative picture here, one without the dramatic fireworks of the novel. As is not uncommon among his peers, Cianfrance appears to be a misconceived multi-hyphenate; he’s a much better director than he is screenwriter/adaptor.